Streptomyces sp. isolated from marine sediment collected from Palk Strait, Bay of Bengal was investigated for its antagonistic potential. The isolate exhibited antimicrobial activity against selected bacterial strains of clinical importance such as Staphylococcus aureus MTCC 3160, Bacillus pumilus NCIM 2327, S. aureus (methicillin resistant), Escherichia coli MTCC 1698, E. coli (ESBL), Shigella flexneri MTCC 1457, Proteus vulgaris and Enterobacter cloacae. Phenotypic and molecular characterization ascertained the isolate BDK01 as Streptomyces chumphonensis. Media optimization with one variable-at-a-time strategy was attempted to identify the ideal concentrations of starch (5–15 g/l), casein (0.01–0.05 g/l), NaCl 1.0–3.0 g/l, pH (4.0–9.0 g/l), temperature (25–45 °C) and inoculum level (0.5–5 ml) towards achieving maximum antimicrobial compound production. Statistical optimization of production media was carried by establishing an 11 variables 17 run experiment through PB model which evinced starch, calcium carbonate, pH and inoculum concentration that highly influenced bioactive compound production. Spectral data of active ethyl acetate extract revealed the presence of various bioactive compounds such as Salicyl alcohol, N-phenyl benzamide. 6-Octadecenoic acid, (Z), 1,3,5-Cycloheptatriene. Antiproliferation activity of active fraction against MCF-7 Cell line exhibited IC50 value of 9.5 µg/ml. 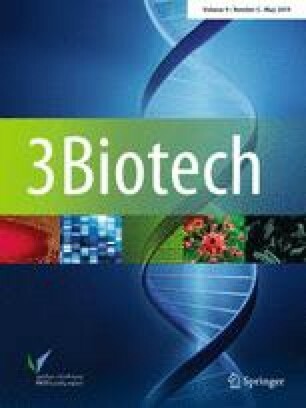 Overall, it is observed that the marine actinomycete S. chumphonensis BDK01 could be employable as promising strain for novel antimicrobial and cytotoxic metabolites. The online version of this article ( https://doi.org/10.1007/s13205-019-1687-7) contains supplementary material, which is available to authorized users.